One of the most popular articles to date at Mobile Cuisine is Writing a Food Truck Business Plan where we covered the aspects of writing a business plan for your future food truck business. The most common question we receive on this topic is how long it should take to put a complete project together. Unfortunately, it’s not something that you should be able to develop overnight unless you have quite a bit of experience in putting business plans together. Because of this, we felt we would give you some tips to help in your business plan creation. The process of business plan creation will probably take longer that you originally estimate. Along the way you will probably stop and think, “you know, we haven’t really thought our strategies out very well, have we?” or “we don’t really know our competition as well as we thought we did,” and you will take the time to hone your plan and get up to speed on the competition before you finish the plan and present it to prospective lenders. Start your food truck business plan as an outline. By breaking the large task down into smaller components, the task won’t seem as scary. 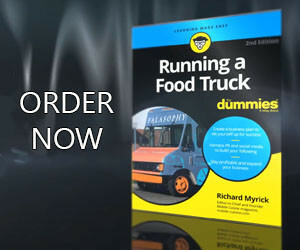 Your food truck’s business plan should be looked at as simply as the answers to a series of questions. The visual aspects of your business plan should never be overlooked. Color charts, tables of data to break up the text, paragraph headings and varying the font styles all contribute to making a plan easier to read and to clearly explain your thoughts. Authors typically read many, many, books and stories. They learn their craft by studying the works of their favorite authors. You need to do the same thing during the business plan creation process. Look at examples of business plans to get in your mind the writing style, the sequence in which the ideas are presented, and the parts of a business plan. Sample plans are available on the Internet at sites devoted to assisting entrepreneurs in just about every business. I would suggest looking at plans structured on a restaurant, bar or if you can find one, another food truck, but never copy them word for word. If you have never written a business plan before, you may have difficulty getting the project started. It will seem as though you have an awful lot of blank pages staring back at you. To get your food truck business plan moving, start with the section that is easiest for you, or of most interest. People often underestimate the effort and energy it takes in business plan creation. They try to write it at night or when everything else at work is finished, in other words, when they are mentally and sometimes physically exhausted. A better approach is to write the plan when you have energy available to put into it: go in early and think and write for an hour before you start food prep and the phones start ringing. The first draft of your food truck business plan will undoubtedly resemble a jumbled stream of ideas. It will look nothing like what you had hoped it would. Don’t let this get you frustrated. It will get better the longer you work out the details and answer the questions it poses. Put the draft away for a few days, come back to it fresh, and begin revising and rewriting. After several more revisions, the ideas will all come together and the language of your food truck plan will flow. Your business plan should reflect the personality of your management team, and the type of mobile business you want to create. As the reader (aka lender) goes through it, they should get to know the people involved in the company, their vision, their objectives, and their enthusiasm for the company and the mobile food industry. Tell the story of your food truck in your own voice. This why I always suggest against using sample business plans. Business plans are essentially works of fiction. They are the documents that will share what you imagine, plan and hope may occur in the future of your food truck business, not what has already occurred. This type of writing can be difficult. The problems you are having keeping the words flowing are precisely the ones faced by almost every professional writer. The big difference? Many of them have to keep going because the publisher has given them a deadline. You of course, having read our first tip you have allowed plenty of time to finish the business plan; so there’s no reason to feel pressured. Right?